The common persimmon tree (Diospyors virginiana) grows in the wild from Connecticut to Florida and as far west as Oklahoma and Kansas. The edible fruit of the persimmon has an astringent taste when not fully ripe. Used in recipes to make puddings and cakes or eaten fresh, the fruit of the persimmon was also a part of the diets of Native Americans. The common persimmon tree has certain features that will help you in its identification. Look for a medium size tree that reaches heights of around 40 to 70 feet. The persimmon tree is sometimes no larger than a shrub in the northern part of its geographic range, but the larger specimens in the South will have a trunk diameter of from 1 to 2 feet. 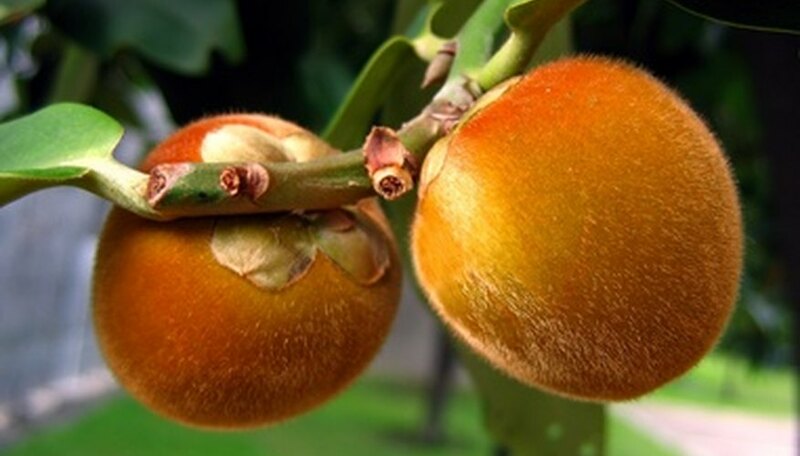 The persimmon tree has a rounded crown thick with branches. Examine the leaves on a persimmon tree, looking for foliage that measures 2 to 3 inches in width and between 4 and 6 inches long. The leaves should be oblong and have a glossy dark green upper half, with the underneath surface pale green in color. The leaves will look leathery and the edges smooth, with a pointed tip on the ends. The persimmon tree is often a darker green than surrounding species and the leaves can sometimes take on purple, orange and red colors before falling off in autumn’s chill. Inspect the persimmon tree’s bark, checking for thick furrowed bark that seems broken into squares. The bark of a persimmon is a black to brown color. If you expose the inner layer of bark of a persimmon tree to the air, the University of Florida Institute of Food and Agricultural Sciences website says it will change to a yellow hue. Study the flowers that develop on the branches of the persimmon tree late in the spring and early during the summer. The flowers will be quite tiny but have four visible yellow petals as well as a green leaf-like calyx that will become part of the persimmon fruit. The fruit only develops on the female persimmon trees, green at first but slowly growing into a rounded form that can be 2.5 inches wide. The fruit turns orange-pink, gets soft and wrinkles as it ripens. Look for a persimmon tree to grow among species such as sycamores, loblolly pines, yellow poplars, oaks, hickories and sugar maples. Persimmon prefers the moist soils of valleys but adapts to grow in clay, sandy or rocky soils as well. The tree will often grow in upland sites, along roadsides, in clearings and old abandoned fields. You may sometimes notice smaller persimmons growing up around a larger one, as the trees emerge from the older persimmon’s roots--a process known as suckering.